The exact causes of prostate cancer are unknown, but a combination of genetic and environmental factors are believed to contribute to the development of the disease. 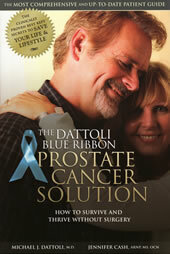 Age, race and family history are the most important risk factors for prostate cancer. 3. One or more relatives are diagnosed before the age of 55. We know that at least 10% of prostate cancers are inherited directly from parents, while most prostate cancers appear to be acquired because of the way we live and what we are exposed to in the environment. These non-genetic factors may include diet, smoking, industrial pollution, excessive alcohol consumption, association with certain viruses (e.g. human papilloma virus), stress, and so forth. 4. Family members having breast cancers and/or ovarian cancers place men at increased risk of developing prostate cancers. In addition to a positive family history, Caucasians 50 years of age or older and African American males over 40 years of age are at increased risk. Prostate cancer occurs almost 70% more often in African American men than it does in white American men, and African Americans have the highest prostate cancer mortality rates of any ethnic group. Researchers have identified several inherited genes that appear to increase the risk of prostate cancer, and research in this important field continues.